Toppik Reviews - Is it a Scam or Legit? Toppik’s keratin hair fibers cling to your existing hair using natural static electricity and create the appearance of fullness, density, and even coverage. Whether you’re a man or a woman, Toppik hair fibers promise to adhere to your hair, blend in naturally, and increase fullness in just a few seconds. Simply style your hair, shake on the fibers, pat gently, and apply the FiberHold Spray. From there, the company advertises that they’re sweat, wind, and rain resistant, so they won’t come off until you shower and shampoo. Based on their relatively inexpensive price, ease of use, and seemingly effective results, there appears to be a lot to like about Toppik. But are their fibers the only game in town? And if so, how can you choose which option will deliver the most bang for your buck? This is the central question we’ll help you answer here, starting with a closer look at the basics. How Does Toppik’s Hair Fiber System Work? According to the company’s website, the fibers are made from high-grade, naturally derived keratin; the same protein that makes up most human hair. This way, they’re able to use their innate static charge to bind to the hair on your head, blend in, and provide a natural appearance, regardless of your hair’s type or texture. They can even be used on beards. Toppik’s keratin fibers naturally bind to individual hairs using subtle static electricity, a bond that can be boosted with their FiberHold Spray. Credit: Church & Dwight Co., Inc.
Toppik’s fibers are available in nine colorfast shades, which they say can be mixed to match any hair color (including grey roots and color-treated regrowth) and won’t run or rub off on clothing or pillows. However, they emphasize that you should only apply fibers after using styling tools (hair dryers, flat irons, curling irons, etc. ), as well as any styling products other than hairspray (gels, mousses, pastes, serums, etc.). Doing otherwise could cause shifting and expose thin areas you might want to be covered. 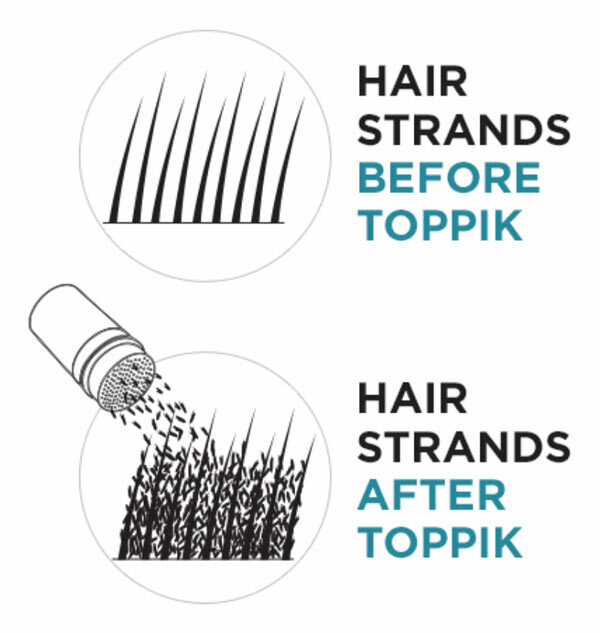 In order to provide even coverage and a natural-looking hairline, Toppik’s Hairline Optimizer features a unique row of irregular teeth to “naturally frame the areas around the face, including the forehead and temple,” as well as to prevent fibers from falling on your forehead during application. Finally, while the static charge of Toppik’s fibers is said to hold them sufficiently in place, their optional FiberHold Spray promises to further strengthen this bond, while also adding shine. When it comes time to remove, simply wash your hair with shampoo as normal. Could Toppik’s Fibers Cause Side Effects? Toppik emphasizes that their fibers are for external use only, and that you should discontinue use if irritation or a rash appears. If the fibers make contact with your eyes, rinse with water. Do not use near an open flame or while smoking. According to Jeffrey Rapaport, MD, a dermatologic surgeon based out of Englewood Cliffs, NJ, concealers like these rarely cause side effects, and when they do they're most often related to allergic reactions. How Much Does Toppik Cost & Where Can You Buy? Available in nine shades (black, dark brown, medium brown, light brown, auburn, medium blonde, light blonde, grey, and white), Toppik’s fibers are available through a special TV offer for $29.95, plus free S&H. For this price, you’ll receive a 27.5g (60+ days worth) bottle of hair fibers, in addition to the Hairline Optimizer and Spray Applicator as free gifts. Important: However, this price only applies to your initial order. Future orders will receive a 10 percent discount off standard prices (more below) and will be automatically shipped to you once every 60 days, until you call to cancel. Alternately, you can place a one-time order for a bottle of Toppik fibers via this same TV offer, priced at $46.95, with no free gifts. Toppik’s fibers were available on the company’s main website as well, in four different sizes, with standard prices between $7.95 and $79.95 each. The same set promoted on the TV offer site was priced at $35, with no ongoing commitment. A standalone bottle of FiberHold spray was priced at $9.95, with additional products (serums, shampoos, conditioners) and accessories priced between $4.95 and $24.95. From a third-party perspective, we also found Toppik’s fibers for sale on popular marketplaces like Walmart.com and Amazon.com, as well as retailers like Bed Bath and Beyond, Dermstore.com, Overstock.com, and Ulta for about the same prices. Just keep in mind that Bed Bath and Beyond frequently offers coupons for in-store purchases, which could help you save even more money, while putting Toppik’s fibers in your hands faster. All direct purchases come with a 30-day money back guarantee, less S&H, which you can request by calling 800-844-2536. What Can We Learn From Toppik Online Customer Reviews? On Amazon, more than 3,000 customers had given Toppik’s fibers an overall average rating of four stars. Most compliments revolved around effective coverage and thinning concealment, as well as boosting the appearance of fullness, leading to increased confidence. On the other hand, most complaints appeared to reference ineffective results, unattractive appearance (mismatched color, powdery look and texture, etc. ), and that you need to have a decent amount of hair for the fibers to attach to (i.e., they typically won’t work if you have little or no hair). Across sites like MakeupAlley and Ulta, we encountered much of the same general feedback and overall ratings. Toppik products are manufactured by Church & Dwight Co., Inc., a publicly traded company based out of Ewing, NJ who’s also behind popular brands like Waterpik, OxiClean, Arm & Hammer, Orajel, and First Response. They held an A- rating with the Better Business Bureau, based on 26 closed complaints, as of 2/7/18. Most seemed to reference difficulty processing refunds, although a company representative responded in each instance. Compared to other hair loss treatments like Rogaine (Minoxidil), which are intended to halt hair loss and potentially regrow hair, or full-on medical procedures available through companies like Bosley, fibers like Toppik are considered a temporary cosmetic solution only. But do they have any competition? In short; yes. In fact, in addition to the popular name brand products below, you’ll find perhaps dozens of generic brands online, most of which promise to deliver the same results. How do their core criteria compare? DermMatch $47 - $141 Not a fiber; more of a concealer that uses natural botanical ingredients to soften and soothe skin Can swim, sweat, or brush your hair with it. Can be used along hairlines and shaved heads. Given the fact that this is just a sampling of your options, which can vary greatly in quantity, price, material, and additional products offered, where can you possibly start? In How to Choose a Hair Loss Product, we outline that you should start by speaking with your doctor to determine the cause of your hair loss. While the condition is typically harmless, there can be some potentially serious causes in some instances. From there, your next factor to consider should be how advanced your hair loss is because traditional static fibers require some hair to attach to. So, if you have little-to-no hair in places, you might not achieve the results you’re expecting. Exactly where your hair loss is occurring should also be a consideration, since fibers often work best on the top and crown of the head, versus the hairline. And it goes without saying that they’re only considered a temporary solution since they’ll wash out the next time you use shampoo. Whether or not Toppik really is the number one instant solution for thinning hair, as claimed on their website, we weren’t able to confirm during our research. We also didn’t test the fibers ourselves to provide any firsthand feedback. However, we did learn that the product line comes from a reputable company offering a competitive price, and who backs it with a 30-day refund policy in case you’re dissatisfied. It’s also sold through many different third-party retailers and comes with highly positive online customer feedback. In the end, this means you might not have much to lose than a little bit of your time, and perhaps shipping back to the manufacturer, for giving Toppik a try. Returning to our conversation about expectations, though, many customers report varying success with wind, water, and rain resistance. Just a shout out for Toppik! I am a 73-year-old female and have thinning hair only on one side, so I bought this product. I worried it would fall out on my pillow...it DIDN'T. I thought it might fall like dandruff, it DIDN'T! I don't wash my hair every day, but guess what...it stays in! I am totally happy! I am a woman with slight thinning on the crown. Toppik (and other products like it) do wonders for the look of my scalp and hair. I've been using it for several years, and not one person has noticed it or said anything about it. I get compliments on my hair. Without the Toppik, my scalp would show through, and I would be very self-conscious. It stays on all day, no problem, and comes out easily when I wash my hair. The only thing you have to remember is to not scratch your head. I like the fact that I can run into Bed Bath & Beyond and purchase it, or easily order it on Amazon. The problem is that they trap consumers into subscribing who think they are just ordering the product. I got my subscription "order," I called immediately to cancel, and they told me that I could not cancel, even though they had not shipped the product. I had to wait for the order to come and "refuse" it. Obviously many will not finish the process, so they get two orders for the price of one. If you are thinking of buying the TV special of $29.95, make sure to read ALL of the print on the order page as you will automatically be signing up for automatic refills to the tune of $45.95. Make sure you are aware of that. I was not. Write a Review for Toppik!